Production of the Dodge Grand Caravan will continue this fall -- just not for dealers in the United States, according to a union official at Fiat Chrysler's Windsor, Ont., assembly plant, where the minivan is built. U.S. dealers were told this month to stock up on the Dodge Caravan because, after August, they wouldn't receive any additional stock for at least seven months. The dealer communication indicated that there would be "No Grand Caravan production" until December, when output of the 2018 model year Grand Caravan will begin. FCA plans to suspend Grand Caravan output for the U.S. market starting in August. Though a reason for the suspension wasn't given, a former FCA engineer who worked on the Grand Caravan program told Automotive News that the current Grand Caravan does not comply with a new U.S. federal safety regulation on ejection mitigation. The new safety rule is set to go into full effect in September. The regulation, FMVSS 226, requires manufacturers to modify side impact air curtains, making them larger to more fully cover window openings and more robust so that they stay inflated longer. The new standard also requires that side-curtain airbags deploy in the event of either a side-on collision or a rollover. The rule was adopted in 2011, with a phase-in beginning in 2013. The new safety rule doesn't affect Grand Caravans bound for Canada. A spokesman for FCA declined to confirm or comment on the plan to idle minivan output for U.S. customers. However, a spokeswoman for FCA Canada issued a statement on the company's plans to the Windsor Star, confirming that the suspension in output "is being taken to address U.S. regulatory actions. 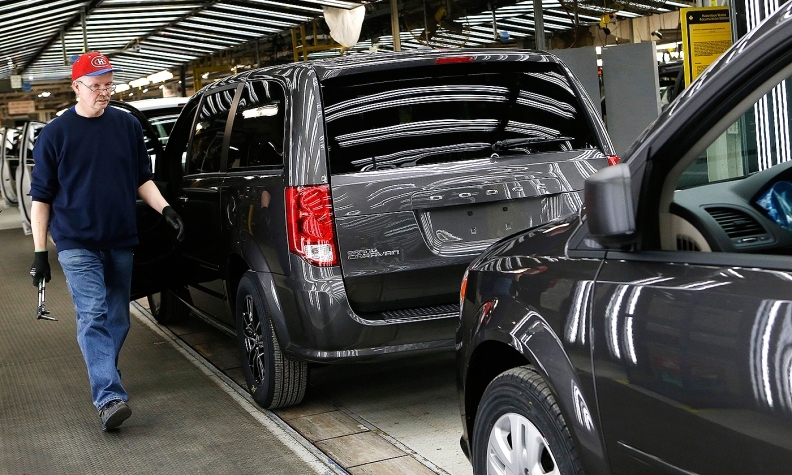 Production of the Grand Caravan for the Mexican and Canadian markets is not [affected]." Unifor Local 444 President Dino Chiodo, who represents workers at FCA's Windsor assembly plant, said production of Grand Caravans will not stop altogether this summer. Chiodo said Grand Caravans will continue to be assembled and shipped without any engineering changes to dealers in Canada and Mexico through the fall. Allpar.com, an FCA-centric website, reported last week that a source inside FCA confirmed that the automaker is accelerating an internal project to meet the new U.S. side-impact standards for the 2018 model year. FCA originally planned to kill off the Grand Caravan this year, before the new safety standard went into effect. However, Chiodo said the automaker's plan now appears to be to meet the new safety rule and keep the Grand Caravan alive until at least mid-2019. He said the Grand Caravan is still popular and profitable for FCA. The Grand Caravan is by far Dodge's best-selling vehicle in the U.S., with sales through May up 7.8 per cent to 63,657, though registration data indicates that more than 60 per cent of Grand Caravan deliveries are to fleet customers. That is by design, as FCA uses the Grand Caravan to meet minivan demand from daily rental fleet customers to protect the residual value of its more expensive Pacifica minivan, which launched last year. The Grand Caravan is also a lower-priced alternative to the Pacifica for many families. U.S. dealers also were told this month that only the two lowest-trim -- and lowest priced -- versions of the Grand Caravan will be available through August: the US $27,090 SE and the US $29,790 SE Plus. Prices include shipping. By comparison, the least costly Pacifica starts at US $36,090, including shipping. Grand Caravan stockpiles are also the lowest of any vehicle in FCA's lineup. The automaker began June with just 11,967 units in unsold inventory, a 22-day supply.